As I mentioned in my last post, I am a firm believer that chocolate and Valentine's Day must be paired together. Of course this does not mean I like giving boxes of chocolates to my loved ones on Valentine's Day...or any other holiday for that matter. I am very fond of homemade gifts, giving and receiving. I think it is much more special to give away a box of chocolate cookies or some homemade nutella. If you have been following Baked Perfection for a while now, you know I have paired up a couple times with OhNuts.com. They offer to send me some nuts and I get to make whatever I want with them. Sounds like a pretty good deal to me. 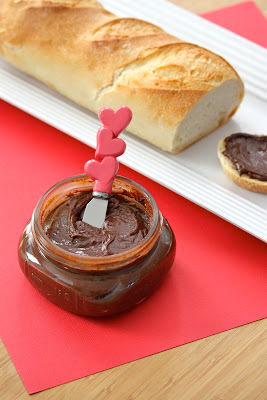 This time I decided to go with their hazelnuts and immediately I knew I was going to make homemade nutella. I conveniently found a recipe on the Oh Nuts Blog and went with it. I found the homemade version to be a little nuttier than the store bought stuff, but equally as delicious. 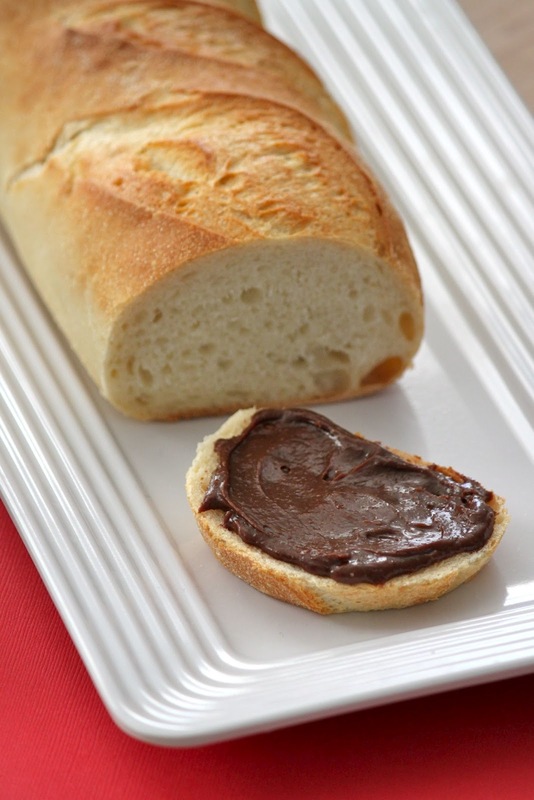 As you can see from the photo, I like my nutella with french or sourdough bread, but it is great on absolutely anything. Preheat oven to 350 degrees Fahrenheit. Place hazelnuts on an ungreased baking sheet and place in oven to toast. Stir every 3-4 minutes until brown and fragrant, approximately 10-12 minutes. Set aside to cool. Add the cooled hazelnuts to your food processor. Continue to process for several minutes (5 or more) until the hazelnuts are processed into a liquid. Scrape down the sides of your processor and process again until there are no lumps remaining. Meanwhile, combine the chocolate, condensed milk, and honey in a heat proof bowl. Use a double boiler to melt the chocolate, condensed milk, and honey together. Stir the mixture frequently until evenly melted and smooth. Add the warm chocolate mixture to the food processor with the liquified hazelnuts. Process for 1 -2 minutes until smooth and the mixture becomes shiny and smooth.